The syntax to write a nested class is given below. Here the class Outer_Demo is the outer class and the class Inner_Demo is the nested class. 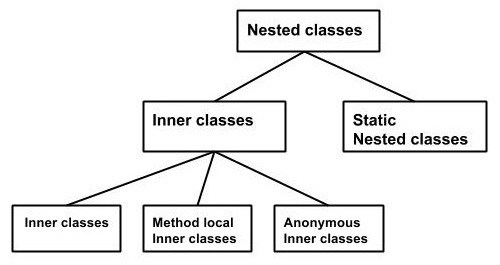 Non-static nested classes: These are the non-static members of a class. Static nested classes: These are the static members of a class. Creating an inner class is quite simple, just need to write a class within a class. Unlike a class, an inner class can be private and once you declare an inner class private, it cannot be accessed from an object outside the class. Given below is the program to create an inner class and access it. In the given example, we make the inner class private and access the class through a method. Inner classes are also used to access the private members of a class. If you compile and execute the above program, you will get the following result.